I can't believe we're HALF WAY through November! It has just flown by. We're trying our best to not get too Christmassy over here, but I must admit that a night of She & Him Christmas and ginger molasses cookies has happened, and it was glorious! 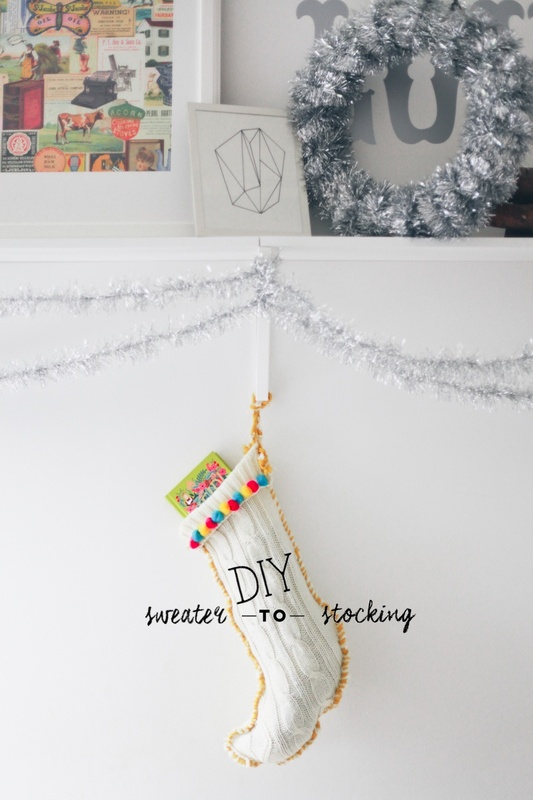 Here is a fun and easy DIY for making a cozy knitted stocking out of an old sweater! I picked this one up at a thrift store and it just didnt' fit right, so it was perfect for this diy. I chose do keep the stitching on the outside to give it a bit of a fun and colourful look, but you can also stitch it flipped inside out if you prefer to keep it a bit more "classic." 1. Cut down the centre of the sweater (depending on the size you want it), cutting through both sides of the sweater and following the stocking shape of your choice. Make sure you work with the already stitched part of the sweater so there's one less part that needs stitching together! 2. Using an embroidery needle and yarn, stitch together the two sides starting at the top, and working your way around. 3. Once you reach the top, fold it down and secure a few stitches on the sides to secure the fold in place. 4. Add pom pom's along the top by going through the pom pom with your needle and yarn, and adding one stitch where you would like it to stay in place. Continue with the pattern you want to make with the pom poms. 5. Make a loop perfect for hanging your stocking by the fire! I braided together one cut piece of fabric from the sweater, and a few strands of yarn. Secure this with a few stitches to the side of the stocking! Now it's ready to hang by the chimney with care.